Super heavy and works well with a glam theme. Only gave 4 stars because the beige is a little duller than expected. Good value. Safavieh Handmade Soho Leopard Skin Beige N. Z. Wool Rug - 9'-6" X 13'-6"
Safavieh's Soho collection is inspired by timeless designs crafted with the softest wool available. This rug is crafted using a hand-tufted construction with a pile and features main accent color of beige . Delight your guests and effortlessly update the appearance of your home with this attractive area rug. This New Zealand wool throw rug features a contemporary design with stylish neutral colors and can accent the decor in any room beautifully. Dimensions 11 ft. x 15 ft.
"Is the background gold or beige. The picture looks yellow gold." It is more of a warm golden tone. Definitely not gold. Wanted more gold but is beige/tan. More subdued than expected. 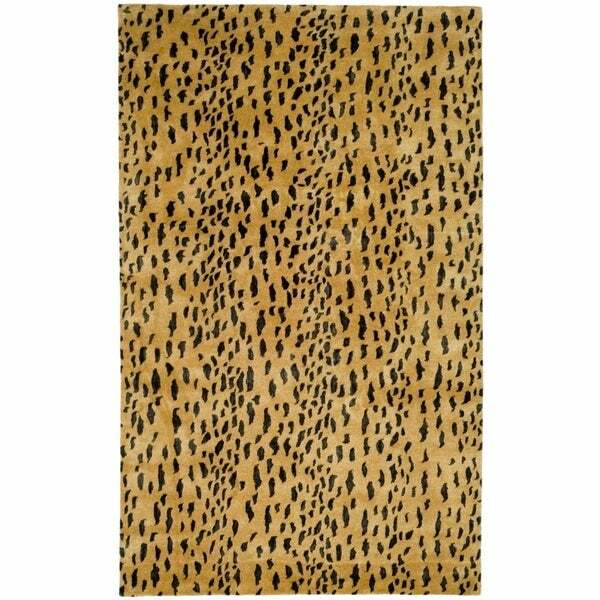 Safavieh Handmade Tiger Beige/ Brown New Zealand Wool Rug - 9'-6" X 13'-6"
Rubber Back Beige Multicolor Floral Non-Slip Door Mat Rug (1'6 x 2'6) - green - 1'6" x 2'6"